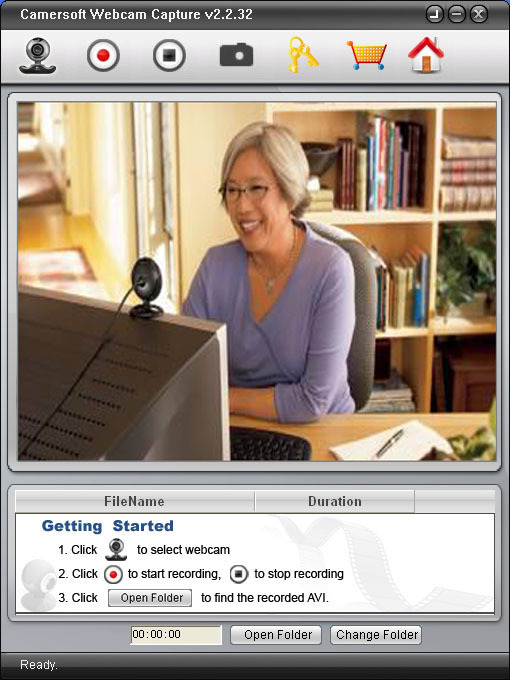 Camersoft Webcam Capture Freeware is powerful and professional webcam recording software, which could record webcam into AVI video files and you could replay them on your PC with Windows Media Player or other video players whenever you want. This free webcam recorder could also work as a webcam monitor or webcam surveillance tool to monitor your home or your children. In addition, Camersoft Webcam Capture is completely free software. ...... In addition, Camersoft Webcam Capture is completely free software and you could download to use it without any payment. This free webcam capture tool is very easy to use with simple and friendly UI, even for the beginners who are not familiar with PC software.When the webcam capture program startup, it could automatically detect the webcams connected to your PC and show the webcam image instantly. And you just click "Record" button to experience the recording and enjoy your own digital video movies. The webcam recorder provide the Snapshot function, you could capture a webcam image and save it as BMP files. Java API to capture and manipulate images from Java code. Qweas is providing links to Camersoft Webcam Capture 2.2.32 as a courtesy, and makes no representations regarding Camersoft Webcam Capture or any other applications or any information related thereto. Any questions, complaints or claims regarding this application Camersoft Webcam Capture 2.2.32 must be directed to the appropriate software vendor. You may click the publisher link of Camersoft Webcam Capture on the top of this page to get more details about the vendor.